Newly inducted Country Music Hall of Fame member Kenny Rogers will receive The Willie Nelson Lifetime Achievement Award during The 47th Annual CMA Awards airing WEDNESDAY, NOVEMBER 6 (8:00-11:00 p.m., ET) on the ABC Television Network. Rogers will be honored with a star-studded tribute featuring performances by Jennifer Nettles, Rascal Flatts, and Darius Rucker. 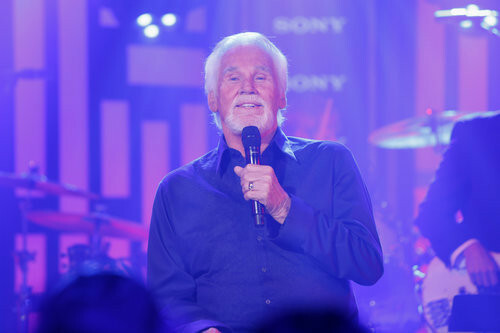 Rogers is a five-time CMA Awards winner with 23 career CMA nominations. He was inducted into the Country Music Hall of Fame in a Medallion Ceremony Sunday night, celebrating a 5 decade-long career. Rogers has sold more than 120 million records worldwide, recorded 24 No. 1 songs and 12 No. 1 albums, is a New York Times Bestselling author, and recently released his 27th studio album – the critically acclaimed You Can’t Make Old Friends, which became his 22nd Top 10 Country album. The Willie Nelson Lifetime Achievement Award was presented for the first time last year to its namesake. The Lifetime Achievement Award was created and meant to be presented to an iconic artist who has attained the highest degree of recognition in Country Music. The Award recognizes an artist who has achieved both national and international prominence and stature through concert performances, humanitarian efforts, philanthropy, record sales, and public representation at the highest level. Lady Antebellum and The Band Perry have been added to the list of artists performing during the ceremony, and previously announced performers Miranda Lambert and Keith Urban will perform together on the CMA Awards for the first time. Nettles is a six-time CMA Awards winner, five of which were for Vocal Duo of the Year as half of Sugarland, and one as a songwriter for penning Song of the Year, “Stay.” Sugarland is nominated again for Vocal Duo of the Year, bringing Nettles’ career CMA nomination total to 19. Rascal Flatts have earned seven CMA Awards and 16 nominations over their career. The trio was named Vocal Group of the Year six consecutive times, and also received the Horizon Award (now New Artist of the Year) in 2002. Rucker is a former CMA New Artist of the Year with four career CMA nominations. He is nominated this year for Single of the Year for “Wagon Wheel,” the No. 1 single from his latest album, True Believers. The hit is also nominated for Song of the Year for songwriters Bob Dylan and KetchSecor. The Band Perry, two-time CMA Awards winners, are nominated this year for Vocal Group of the Year -- their fourth consecutive nomination in the category. The trio took home the trophy for New Artist of the Year and Single of the Year for “If I Die Young” in 2011. Additionally, Kimberly Perry won Song of the Year for writing the track. Hosted for the sixth consecutive year by Brad Paisley and Carrie Underwood, The 47th Annual CMA Awards will air live from the Bridgestone Arena in Nashville. Previously announced performers for The 47th Annual CMA Awards include Jason Aldean, Luke Bryan, Eric Church, Florida Georgia Line, Hunter Hayes with Jason Mraz, Little Big Town, Tim McGraw, Kacey Musgraves, Paisley, Blake Shelton, Taylor Swift with Vince Gill and Alison Krauss, Underwood, and Zac Brown Band with Dave Grohl. Alan Jackson and George Strait will perform together in a tribute to the legendary George Jones.